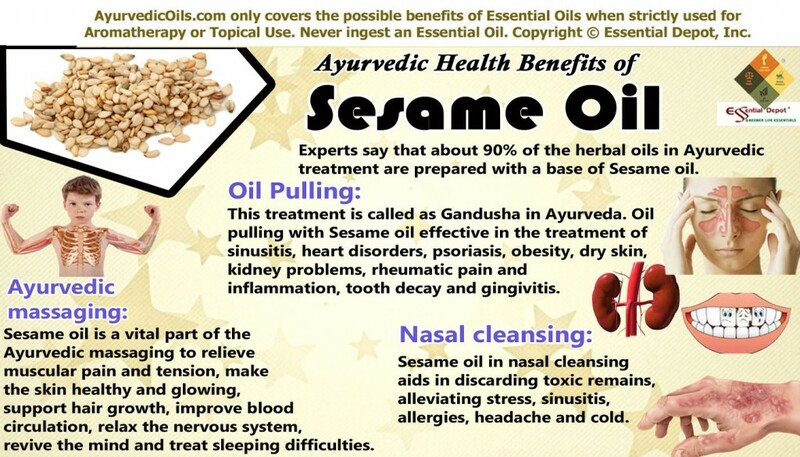 From nasal drops to enema, from babies to elderly people, Sesame oil forms an incredible part of the Ayurvedic regimen. Experts say that about 90% of the herbal oils in Ayurvedic treatment are prepared with a base of Sesame oil. Celebrated for its rich presence of nutrients, this oil is used as a nourishing cooking oil in most parts of India, especially the southern parts of the nation where Ayurvedic system of healing has its roots deeply vested with. 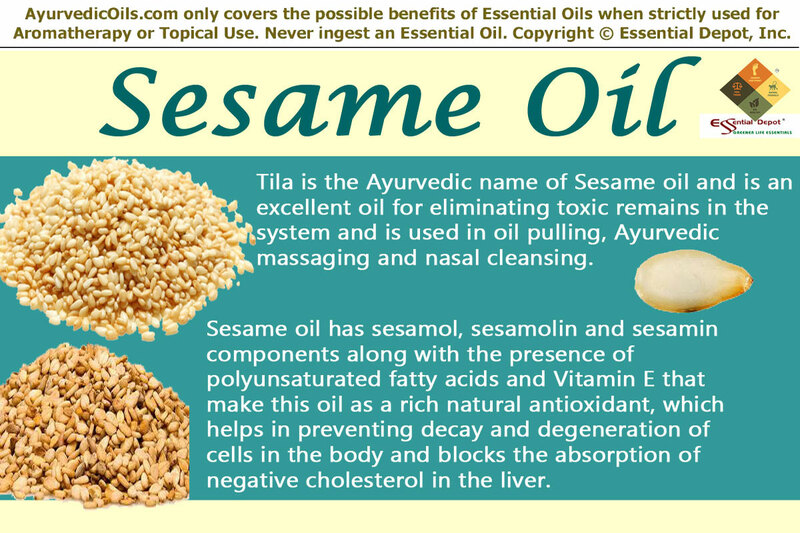 Known as Tila in the Ayurvedic world, Sesame oil is extracted by pressing the seeds of the plant Sesamum indicum (syn. Sesamum Orientale). Sesame oil has been used for its innumerable benefits to mankind and the most touching thing is that the seed hulls left after pressing the oil can be fed to livestock as a wholesome food. This invigorating oil has the longest history of more than 5,000 years just like the ancient Ayurvedic system. This was the main oil crop and was cultivated during the times of Indus valley civilization, the oldest civilization of the world. Sesame was the first crop used for extracting oil. Before 600 BC, Sesame oil was used as a salve, medicine and in food by the rich Assyrians community. From times immemorial, this oil has been an important part of the world of Complementary and Alternative Medicine. Various traditions like Chinese, Korean, Japanese, Southeast Asian and Middle Eastern used Sesame oil as a flavor enhancer and natural health stimulant. Most of the Ayurvedic therapies have registered the use of Sesame oil for its ability to strengthen the system, detoxify the body and ensure the proper functioning of all the vital organs. Sesame seed oil is considered as a sacred oil in many parts of India and is used in votive lamps and other ceremonies of religious importance. Among the seven chakras or the vital points of human energy, sesame oil is said to benefit the heart chakra responsible for unconditional love for others and self, compassion, emotions and all kinds of relationships with the world, root chakra responsible for dealing with the challenges of the world and the spleen chakra responsible for the right to think, self-confidence, self-control and intellect. Sesame oil is rich in vitamin E (potent antioxidant), iron, omega-6 fatty acids, vitamin B6, magnesium, calcium, zinc, copper, dietary fiber and flavonoids phenolic antioxidants. 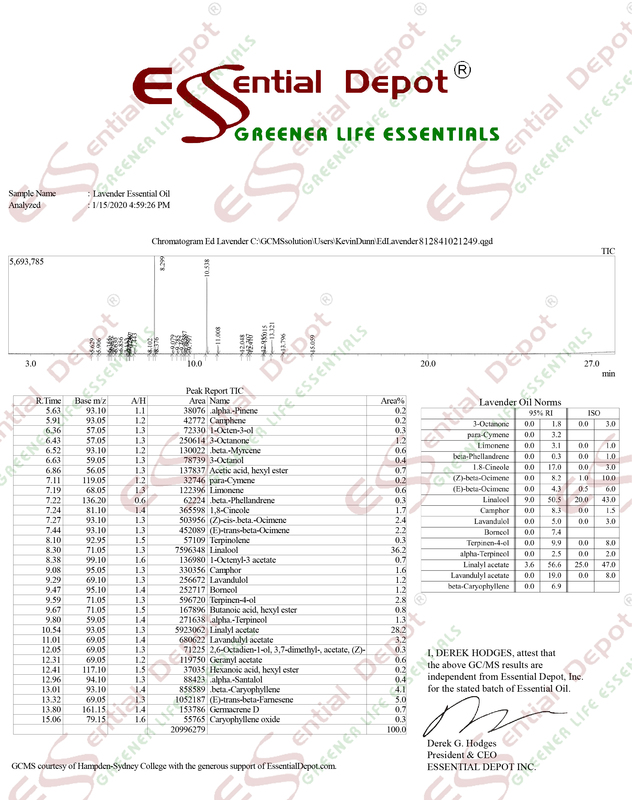 All these enriching nutrients make Sesame oil as a powerful antioxidant with antibacterial, antifungal, anti-inflammatory, antiviral, immune-stimulant, restorative, anti-rheumatic, carminative, tonic, anti-diabetic, anti-atherogenic, cardiac, dermatologic, laxative, emollient, warming and anti-depressant properties. Ayurvedic encyclopedias like Charaka Samhita and Sushruta Samhita have listed enormous health benefits of Sesame oil. Practicing Ayurveda is a sure shot remedy for self-improvement as it involves a systematic life-style along with essential oils, herbal medications, yoga, meditation and physical exercises that keep you fit and fine even in your late 60s. Human body is made up of 3 energy elements known as doshas in Ayurveda. They are vata, pitta and kapha. 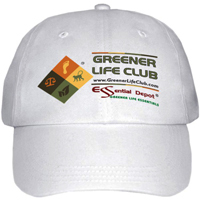 The predominant energy element determines your personality, character and behavior. Sesame oil has the potent to balance excess vata along with kapha and pitta deficiency. This is a simple Ayurvedic therapy that helps in eliminating the harmful toxins from the body and enhances immunity and is known as Gandusha in Sanskrit. It is nothing but swishing 1 tablespoon of sesame oil in the mouth for 20 minutes in empty stomach in the morning and spitting out the toxins-filled remains. This process helps in protecting the dental health known as Dantya Swasthya in Ayurveda. Charaka Samhita (Charaka Samhita Ch V-78 to 80) quotes the act of oil pulling as “It is beneficial for strength of jaws, depth of voice, flabbiness of face, improving gustatory sensation and good taste for food. One used to this practice never gets dryness of throat, nor do his lips ever get cracked; his teeth will never be carious and will be deep rooted; he will not have any toothache nor will his teeth set on edge by sour intake; his teeth can chew even the hardest eatables” . The best oil recommended for oil pulling by Ayurvedic texts is organic cold pressed Sesame oil. Sesame oil has sesamol, sesamolin and sesamin components along with the presence of polyunsaturated fatty acids and Vitamin E that make this oil as a rich natural antioxidant. This property helps in preventing decay and degeneration of cells in the body and blocks the absorption of negative cholesterol in the liver. A popular study on “Effect of Oil Pulling on Plaque and Gingivitis” by Dr. HV Amith proved that 45 days of methodical oil pulling showed a significant decrease in plaque and gingivitis. The antibacterial and antifungal properties of this oil help in treating halitosis or bad breath, plaque, gingivitis and dental cavities. One more study conducted in 2008 on “The Effect of oil-pulling on dental caries causing bacteria” proved the in-vitro antibacterial activity of Sesame oil against dental caries causing bacteria, especially Streptococcus mutans and Lactobacillus acidophilus. This study also witnessed the considerable reduction of the total count of bacteria after oil-pulling. Oil pulling with Sesame oil is also effective in treating cracked lips, eczema, sinusitis, heart disorders, psoriasis, obesity, dry skin, headache, kidney problems, rheumatic pain and inflammation, dry throat and tooth decay. Abhyanga or Ayurvedic massage with Sesame oil is a significant part of the Ayurvedic treatment to relieve muscular pain and tension, make the skin healthy and glowing, regularize the breathing pattern, improve blood circulation, relax the nervous system, revive the mind and relieve stress and sleeping difficulties. These benefits are mentioned in Ayurvedic texts as Twachya , Balya and Keshya. Known as the King of Oils, Sesame oil is completely safe for the use of children and is known to strengthen the bones, joints and muscles by penetrating deeply into the muscles and the bone marrow. It is because of this property, every Indian family massage their new born babies and toddlers with Sesame oil before bath and leave them under sunlight for few minutes allowing the body to absorb vitamin D and nourish the skin cells naturally. The presence of vitamin E and zinc in this oil helps in augmenting the elasticity of the skin; repairs damaged skin cells and promote the production of collagen. Massaging your skin with this nourishing natural emollient aids in preventing the symptoms of aging, wrinkles, acne, psoriasis, wounds, burns and other skin infections. Sesame oil also protects your skin from dangerous ultra-violet rays. Massaging your head with warm Sesame oil stimulates hair growth, controls dandruff, nourishes the scalp, kills the infestation of lice, and eases anxiety and fatigue. It is a long time tradition of Indians to massage their head and body with Sesame oil once in a week and take bath with the herbal powder known Shikakai to reduce the body temperature and enliven the nerves and cells. This oil kills the dandruff causing bacteria and protects the skin and scalp from the harmful effects of chlorine in swimming pool water. Nasya is one important methodology among the 5 methods of Ayurvedic Panchakarma therapy. It is the method of administering herbal oils and medicines through the nostrils. According to Ayurveda, nose is the entrance to the brain. Applying a few drops of Sesame oil in the nostrils as nasal drops helps in treating illnesses above your shoulders. This aids in removing the toxins from the body, alleviate stress, sinusitis, allergies, headache, cold and wrinkles. When used as cooking oil in daily diet, Sesame oil is highly beneficial for the entire system from head to toe. Ayurveda suggests the daily use of this oil and is said to grant Vranashodhana (healing and cleansing internal and external wounds), Agni janana (augmenting the power of digestion and metabolism) and Medha janana (enhancing intelligence). Regular use of Sesame oil helps in fighting cancer with its antioxidant properties, guards the body from DNA damage due to radiation, treats rheumatism, improves digestive health, supports respiratory wellness, aids in preventing diabetes, lowers blood pressure and improve the health of the cardiovascular system. Consult your Ayurvedic physician before using Sesame oil for your individual constitution. This article is only for informational purpose and is not meant to replace your prescribed medicines or the advice of your healthcare professional.